The Stob Pyramids are some of the most interesting earth formations in Bulgaria. 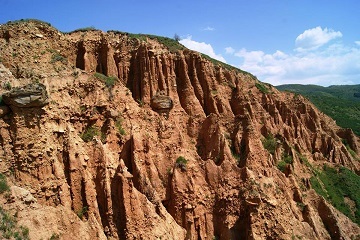 They were formed under the continuous erosion influence. The rains and winds effect gradually shelled the rocks, sculpting the nowadays pyramids. Because of the more slowly erosion effect exactly under the superficial rock segment it remained like a hat over the pyramid’s body. The highest reach up to 10-12 meters. They are recognized for a natural landmark in the 1964. Many legends are told about the rock formations and all of them are related to love. The pyramids are at the beginnings of Stob village. There you can take also a look at the “Sveti Prokopii’ church, erased for the first time soon after the Rila Monastery.